Puzzle Vuzzle Tile — Welcome to the GameSalad forum! January 31 in Announce Your Game! Welcome to Puzzle Vuzzle!!! This is free tile puzzle game. Select image from your gallery and start playing. 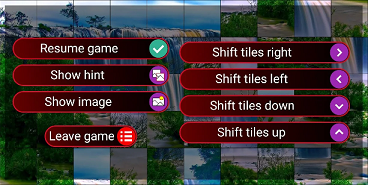 You need to move pieces of image to right places to complete puzzle. Just tap two of them and pieces will swap places. ⚫ Flexible and easy interface to use. ⚫ Customize puzzle size from the smallest 2x2 pieces level to the largest 30x30 pieces game. ⚫ Suitable for the whole family. ⚫ Hint to help play. ⚫ Possibility to view the image to help solve the puzzle. Try the game now and have a lot of fun! Was this game made with GameSalad?